A pioneering five month long project, which aims to leave a lasting legacy for the people of Cornwall, has been unveiled. 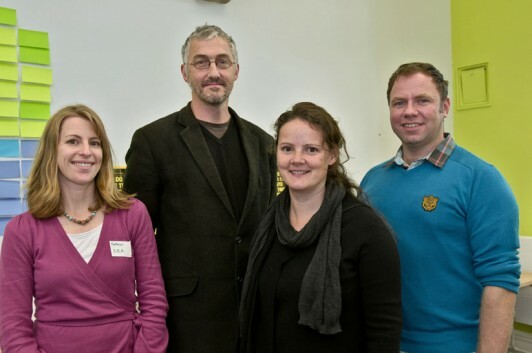 The Big Design Challenge Cornwall (BDCC) was launched at a special event held at Truro Library. The challenge is the final Dott (Design of the Times) Cornwall project and aims to tackle some of the biggest issues facing the people and communities of Cornwall. Challenges already put forward to the project’s website – bigdesignchallenge.co.uk – include the issues of affordable housing and rural isolation. BDDC project manager, Kathryn Woolf, said: “The Big Design Challenge is a practical way to address Cornwall’s issues through community action, inspiring local people to come forward with challenges and design solutions that have potential to improve peoples lives. “We want as many people to come forward and suggest an issue that they think is important to them and to Cornwall. Between now and Christmas the BDCC team will be collecting challenges and ideas relating to different themes: public services, infrastructure and environment, education and skills, work and industry, health and care and home and community. The ideas will then be collated and after Christmas six projects will be selected and given six weeks, funding and support to develop them for a Dragon’s Den style pitch, which will see one winner receive a funding pot of £10k.